Since I got the camera, I’ve been putting the new Sony α7R III through the paces. While leading a photography tour on Kauai and the Big Island in Hawaii we did a doors-off helicopter tour of the Big Island’s Kohala Coast with Mauna Loa Helicopters. While Kauai tends to get most of the credit for dramatic cliffs and waterfalls, it’s my personal opinion that the Big Island has Kauai beat in this area. 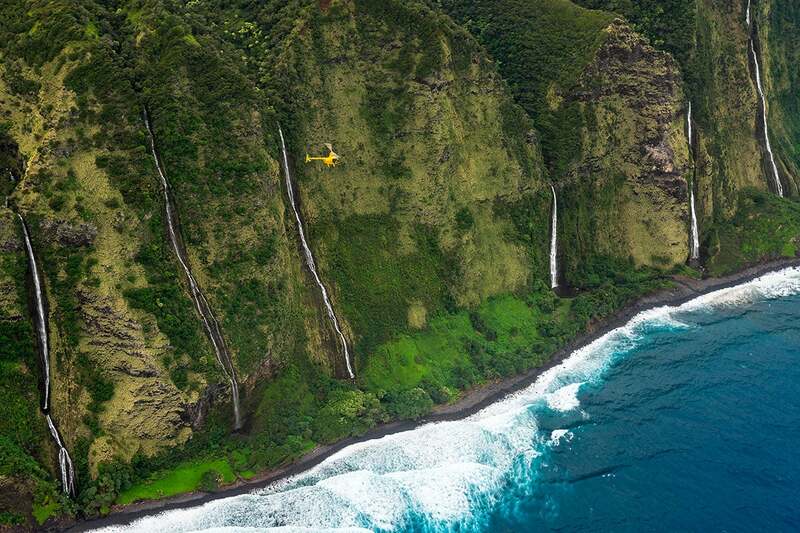 Most people just aren’t aware of the Kohala Coast because of its remoteness and difficulty in reaching it. The coast and valleys within include some of the world’s tallest cliff faces and countless 2,000-3,000-foot waterfalls. If you find yourself on the Big Island, you simply must do this tour! As we approached one of the stretches of cliffs covered in waterfalls, I asked our pilot if he would catch up to the other half of our group so we could get them in our shots for scale. As he closed the distance, I began making changes to my settings. Normally, I try to shoot at 1/500-sec., or faster inside a helicopter. There are all sorts of macro and micro vibrations occurring in a helicopter and a fast shutter speed is vital to overcoming them on a consistent basis. But everything changes when you throw another aircraft into the composition. One of the big “no-nos” in aviation photography is freezing a propeller or rotor in place with a fast shutter speed. This effect doesn’t sit well with our brains because we know these parts are supposed to be spinning. Freezing them in place makes it look as if something is wrong, like the aircraft is going to fall out of the sky at any moment. In order to blur the propeller/rotor, you’ll need to drop that shutter speed down to somewhere around 1/60-1/125-sec., (sometimes you can get away with faster, it just depends on how fast the propeller/rotor is spinning). To achieve this shutter speed, I closed my aperture down to f/6.3 and lowered my ISO to 100. I already had my camera in burst mode, which gives me 10 frames per second with the α7R III. As the helicopter passed between waterfalls, I simply shot bursts of 3-6 exposures hoping that some of them would have a sharp helicopter in them. Trust me, freezing the cliffs and helicopter, while blurring the rotors, while shooting from another helicopter, is no small feat! To increase my odds, I also set the Focus Area on my α7R III to “Lock-on AF: Expand Flexible Spot.” This option will only be available once you set your Focus Mode to “AF-C.” Lock-on AF basically looks at what you’re trying to focus on, draws a box around it, and then tracks it wherever it goes within the frame. The “Expand Flexible Spot” is just one option within the “Lock-on AF” mode. The other options work great too, but this is my go-to for moving objects. This is basically focus tracking on steroids, where the camera intelligently notices what you’re trying to track/keep in focus and then does it for you. No more trying to keep a single focus point on your subject as it moves around in your frame! If your Sony camera has this feature, I highly suggest giving it a go! Just find a subject like a pet, one of your children, a bird flying through the air, or anything else that moves, and see what this feature is capable of. It will blow you away!